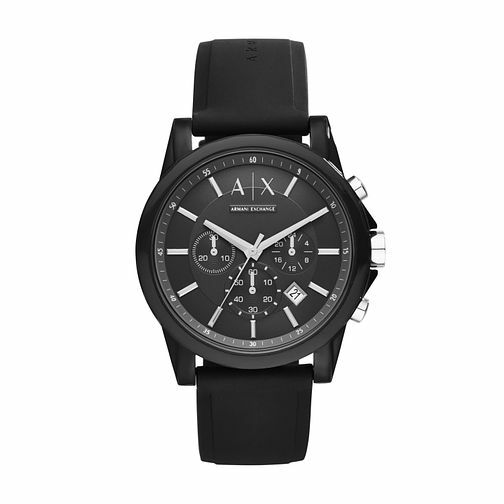 A black chronograph dial with white and silver-tone accents complements a sleek black case and black silicone bracelet in this casual Armani Exchange men's watch. Armani Exchange Men's Black Silicone Strap Watch is rated 5.0 out of 5 by 3. Rated 5 out of 5 by Anonymous from Lovely watch! Perfect condition The watch came in cased in lots of bubble warp to ensure no breakage along the journey and I’m glad to say it has done its service!! Absolutely love the watch it’s gorgeous and came in perfect condition and would be a lovely gift for anyone! Recommend 100%!